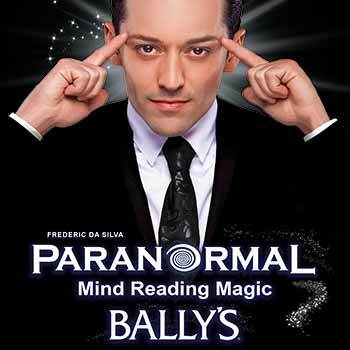 Known around the world for his illusions and tricks of mentalism, Frederic Da Silva will transform what you may think is possible in the course of watching his show, Paranormal- The Mindreading Magic Show. The Las Vegas Spotlight Entertainment Guide named him the “Best Mentalist in the World.” We think that’s a pretty awesome acknowledgment. Seen on television across the globe, he brings his unique mindreading techniques to The Las Vegas Strip. Widely regarded throughout Europe and known as the ‘best-of-the-best for his mentalist skills,’ Da Silva continues to stun American audiences with his style of mystery and magic. Located at Bally’s Las Vegas, his charisma and exacting style are mind-blowing, making him an absolute marvel to witness and be entertained by. How does know what audience members are thinking? Or what they have concealed in their pocket? Willing volunteers participate in hypnotism experiments making it thrilling to watch, as he uses the powers of his mind to discover the right answer. Great show. Kid loved it. Great for all ages. I really enjoyed his show. I actually got pulled up on stage. What I like about him is that he throws Frisbees and you catch them. He is funny and very positive. The more energy you give to him the more energy he gives back.